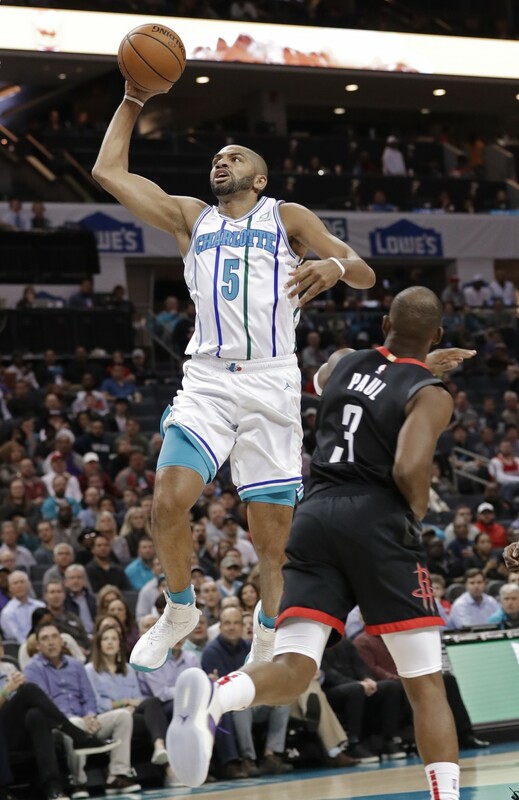 Charlotte Hornets' Nicolas Batum (5) drives against Houston Rockets' Chris Paul (3) during the first half of an NBA basketball game in Charlotte, N.C.
CHARLOTTE, N.C. (AP) — James Harden scored 30 points, Clint Capela had 23 points and a career-high 17 rebounds, and the Houston Rockets beat the Charlotte Hornets 118-113 on Wednesday night for their third straight win. 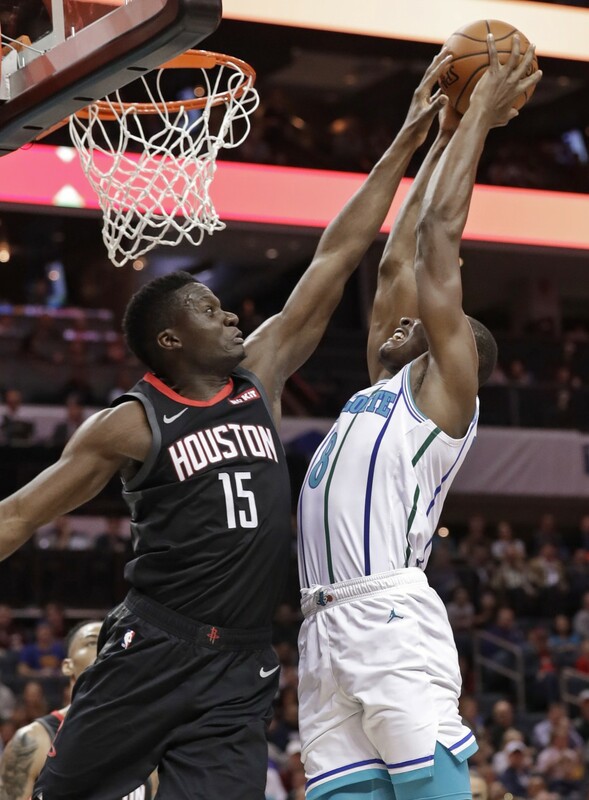 In his first game since ending his streak of 32 straight 30-point games, Harden struggled from the field, missing his first eight shots from 3-point range — even having one blocked by Nic Batum, who gave the MVP candidate fits all night with his defense. Harden finished 10 of 29 from the field and 1 of 11 from 3-point range, but he made two clutch free throws with 17 seconds left to put the game away. He had plenty of support. Capela was solid throughout, and Chris Paul heated up in the fourth quarter and finished with 17 points and 10 assists for the Rockets (36-25). 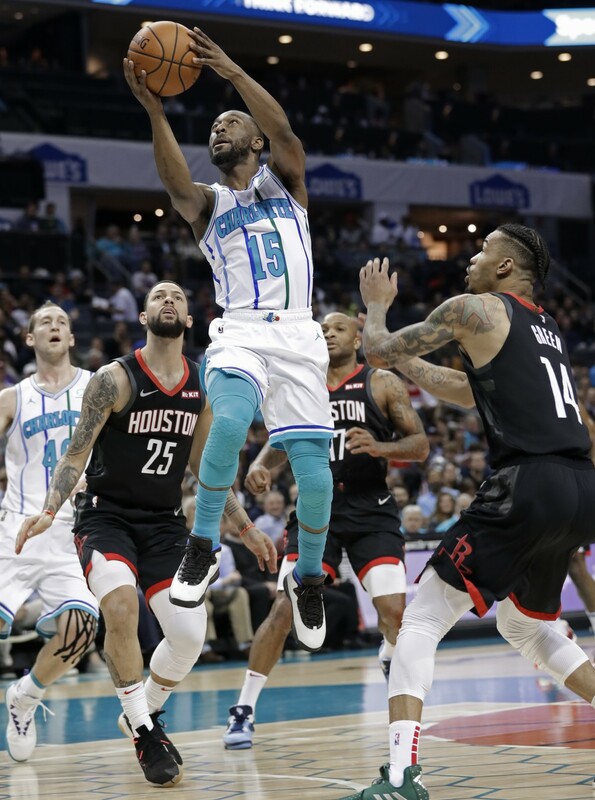 Kemba Walker had 35 points for the Hornets, 27 in the first half. He was 3 of 12 from the floor after halftime. The Hornets battled back behind Walker and Jeremy Lamb, who had 18 points and 14 rebounds, and had a chance to tie with 17 seconds left. 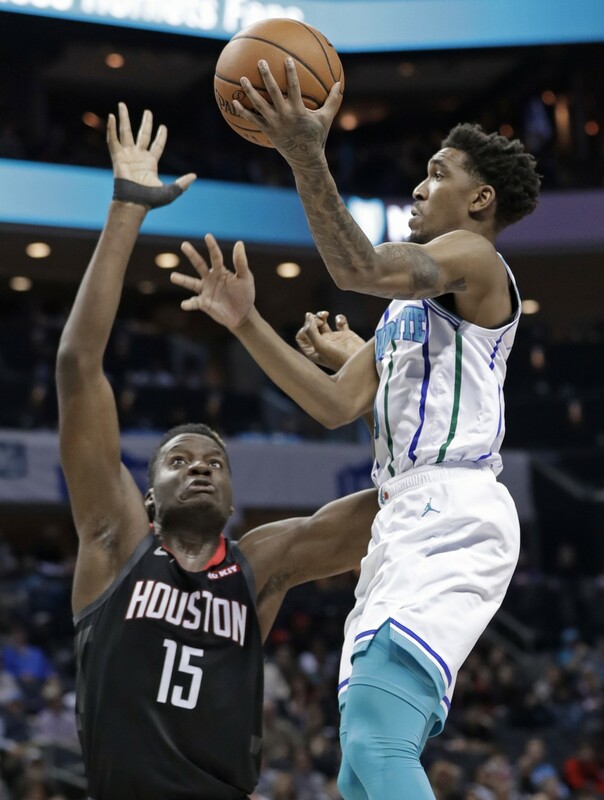 Walker missed a leaning 3-pointer from the right wing and the Hornets fouled Harden, who made two free throws to make it a five-point game. Walker missed another 3 with seven seconds left, and the Rockets escaped with the win. Eric Gordon got the start for the Rockets over Kenneth Faried. 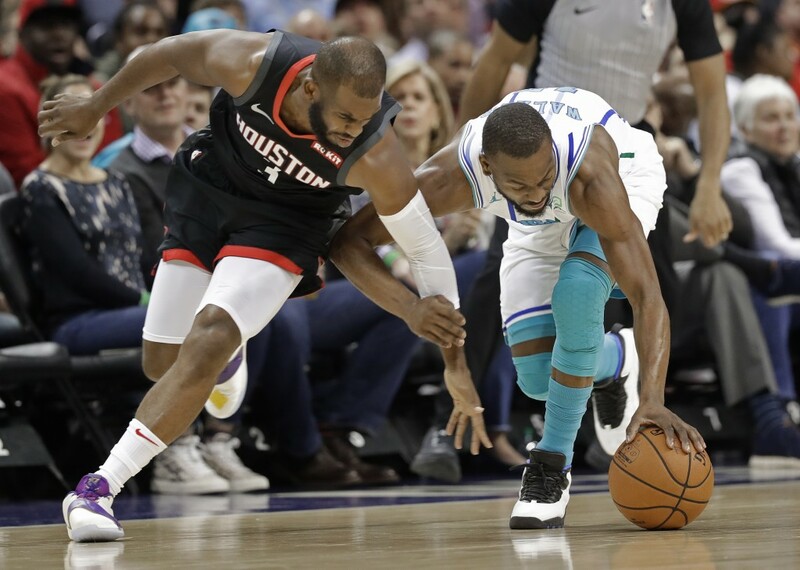 Coach Mike D'Antoni said the move keeps Paul from covering the opposition's point guard for the entire game, which could help preserve his health down the stretch. 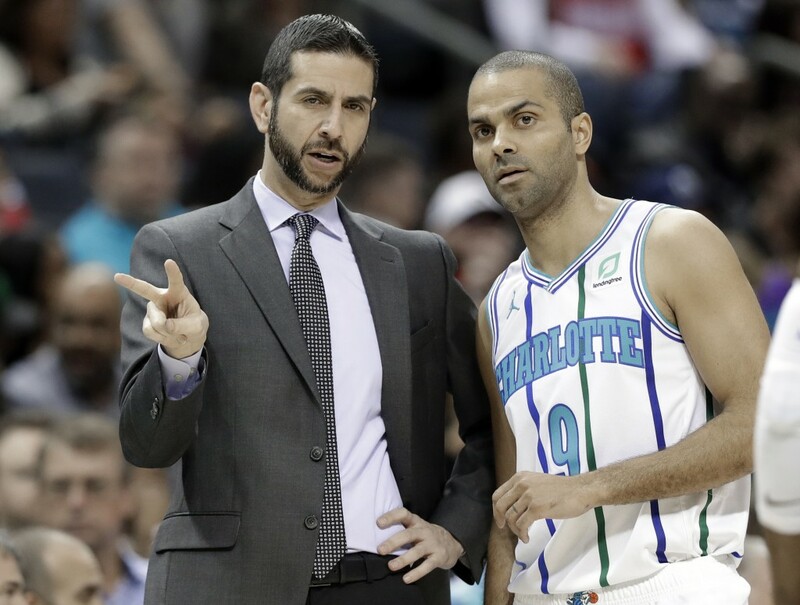 The loss leaves the Hornets a half-game ahead of the Magic in the battle for the eighth playoff spot in the Eastern Conference. Rockets: Scored 41 points in the first quarter on 61 percent shooting. ... Faried didn't start but still managed to pick up his fourth foul by the middle of the second quarter.